As the institution in charge of the German government sponsored initiative "Scientific Coordination of the Support Measure for Sustainable Management" (NaWiKo), Ecologic Institute was involved with several of its working papers. 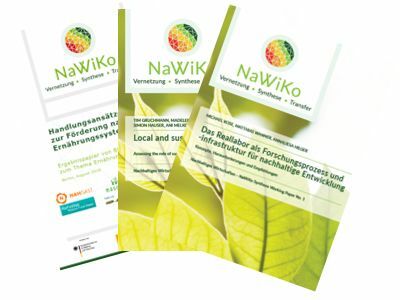 These are available for download and summarise the results of various NaWiKo research projects on specific individual aspects of a sustainable economy, including policy recommendations for promoting sustainable food systems in Germany. Living labs are the focus of the first working paper. In living labs, researchers and practitioners come together to jointly develop solutions for a sustainability problem and try them out in practice. Based on the experience gained in several research projects that have used living labs, the paper provides a comprehensive overview of the structure and implementation of real laboratories. A detailed guide shows step by step how a living lab should be designed. Challenging new roles of scientists in real laboratories are reflected. Finally, the structuring elements of a living lab are presented. The paper also contains a list of factors that should be taken into account to ensure that living labs are successfully established and implemented. The second working paper "Local and sustainable food businesses - Assessing supply chain coordination" identifies key elements of sustainable business models in local food networks. It argues that sustainability aspects need to be emphasized in external communication in order for sustainable business models to be accepted by consumers. The working paper is based on case studies of local food production and distribution networks in Germany and Austria. A third working paper, which Ecologic Institute was involved in preparing, identifies different approaches to promoting sustainable food systems. The working papers are published in a series by Fraunhofer ISI. Rose, Michael; Matthias Wanner und Annaliesa Hilger (2018). Das Reallabor als Forschungsprozess und -infrastruktur für nachhaltige Entwicklung - Konzepte, Herausforderungen und Empfehlungen. NaWiKo Synthese Working Paper No 1. Gruchmann, Tim; Madeleine Böhm; Klaus Krumme; Simon Funcke; Simon Hauser; Ani Melkonyan (2018). Local and sustainable food businesses - Assessing the role of supply chain coordination. NaWiKo Synthese Working Paper No 2. Wunder, S.; Antoni-Komar, I.; Claupein, E.; Dirksmeyer, W.; Eberle, U.; Friedrich, S.; Hafner, G.; Hoffmann, S.; Joerß, T.; Langen, N.; Quack, D.; Schmidt, T.; Schmid, M.; Schulze-Ehlers, B.; Speck, M.; Teitscheid, P.; Teufel, J.; Waskow, F. (2018). Handlungsansätze zur Förderung nachhaltiger Ernährungssysteme. Ergebnispapier von BMBF-Forschungsprojekten zum Thema Ernährung. NaWiKo Synthese Working Paper No. 3.